Acids dissociate into H+ and lower pH, while bases dissociate into OH− and raise pH; buffers can absorb these excess ions to maintain pH. A basic solution will have a pH above 7.0, while an acidic solution will have a pH below 7.0. Buffers are solutions that contain a weak acid and its a conjugate base; as such, they can absorb excess H+ ions or OH−ions, thereby maintaining an overall steady pH in the solution. pH is equal to the negative logarithm of the concentration of H+ ions in solution: pH = −log[H+]. Hydrogen ions are spontaneously generated in pure water by the dissociation (ionization) of a small percentage of water molecules into equal numbers of hydrogen (H+) ions and hydroxide (OH–) ions. The hydroxide ions remain in solution because of their hydrogen bonds with other water molecules; the hydrogen ions, consisting of naked protons, are immediately attracted to un-ionized water molecules and form hydronium ions (H30+). By convention, scientists refer to hydrogen ions and their concentration as if they were free in this state in liquid water. The negative log of 1 × 10−7 is equal to 7.0, which is also known as neutral pH. Human cells and blood each maintain near-neutral pH. The pH of a solution indicates its acidity or basicity (alkalinity). 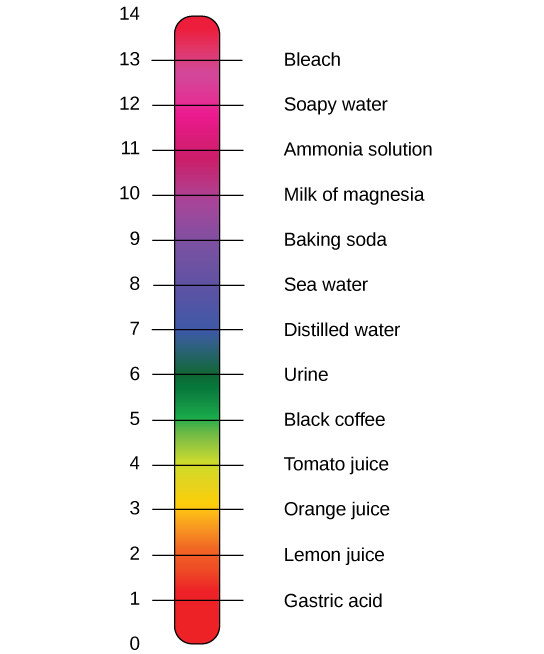 The pH scale is an inverse logarithm that ranges from 0 to 14: anything below 7.0 (ranging from 0.0 to 6.9) is acidic, and anything above 7.0 (from 7.1 to 14.0) is basic (or alkaline ). Extremes in pH in either direction from 7.0 are usually considered inhospitable to life. The pH in cells (6.8) and the blood (7.4) are both very close to neutral, whereas the environment in the stomach is highly acidic, with a pH of 1 to 2. The pH scale: The pH scale measures the concentration of hydrogen ions (H+) in a solution. Non-neutral pH readings result from dissolving acids or bases in water. Using the negative logarithm to generate positive integers, high concentrations of hydrogen ions yield a low pH, and low concentrations a high pH. An acid is a substance that increases the concentration of hydrogen ions (H+) in a solution, usually by dissociating one of its hydrogen atoms. A base provides either hydroxide ions (OH–) or other negatively-charged ions that react with hydrogen ions in solution, thereby reducing the concentration of H+ and raising the pH. The stronger the acid, the more readily it donates H+. For example, hydrochloric acid (HCl) is highly acidic and completely dissociates into hydrogen and chloride ions, whereas the acids in tomato juice or vinegar do not completely dissociate and are considered weak acids; conversely, strong bases readily donate OH– and/or react with hydrogen ions. Sodium hydroxide (NaOH) and many household cleaners are highly basic and give up OH– rapidly when placed in water; the OH− ions react with H+ in solution, creating new water molecules and lowering the amount of free H+ in the system, thereby raising the overall pH. An example of a weak basic solution is seawater, which has a pH near 8.0, close enough to neutral that well-adapted marine organisms thrive in this alkaline environment. How can organisms whose bodies require a near-neutral pH ingest acidic and basic substances (a human drinking orange juice, for example) and survive? Buffers are the key. Buffers usually consist of a weak acid and its conjugate base; this enables them to readily absorb excess H+ or OH–, keeping the system’s pH within a narrow range. Maintaining a constant blood pH is critical to a person’s well-being. The buffer that maintains the pH of human blood involves carbonic acid (H2CO3), bicarbonate ion (HCO3–), and carbon dioxide (CO2). When bicarbonate ions combine with free hydrogen ions and become carbonic acid, hydrogen ions are removed, moderating pH changes. Similarly, excess carbonic acid can be converted into carbon dioxide gas and exhaled through the lungs; this prevents too many free hydrogen ions from building up in the blood and dangerously reducing its pH; likewise, if too much OH– is introduced into the system, carbonic acid will combine with it to create bicarbonate, lowering the pH. Without this buffer system, the body’s pH would fluctuate enough to jeopardize survival. Buffers in the body: This diagram shows the body’s buffering of blood pH levels: the blue arrows show the process of raising pH as more CO2 is made; the purple arrows indicate the reverse process, lowering pH as more bicarbonate is created. Antacids, which combat excess stomach acid, are another example of buffers. Many over-the-counter medications work similarly to blood buffers, often with at least one ion (usually carbonate) capable of absorbing hydrogen and moderating pH, bringing relief to those that suffer “heartburn” from stomach acid after eating.